Hi all! 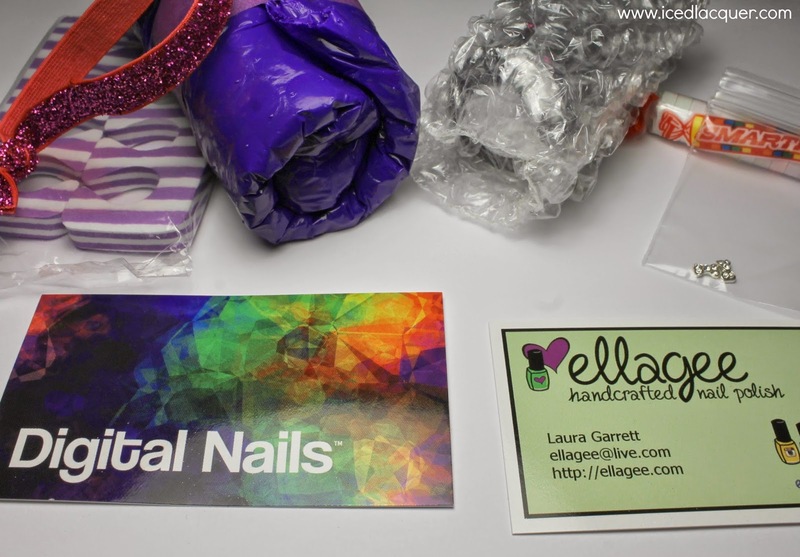 Today I have an awesome collaboration between the two amazing brands Digital nails and ellagee! The inspiration "Fi-Bros For Life" is intended to bring more awareness to the chronic illness fibromyalgia, which both polish makers suffer from. Definitely a great cause to go along with this fabulous duo of polishes! 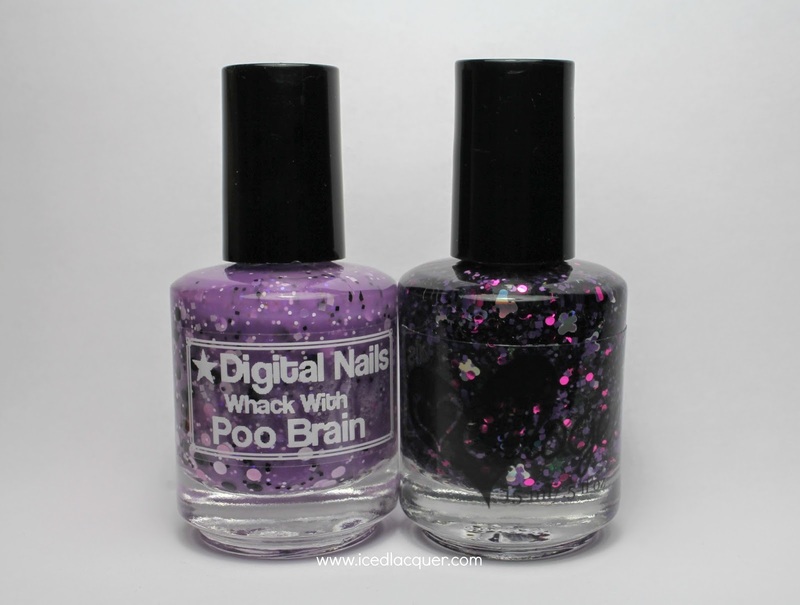 On the left is "Whack With Poo Brain" from Digital Nails and on the right is "Chronic Badass" from ellagee. In addition to the two awesome polishes, I got some fun extra goodies in my box! Some striped toe separators, a super sparkly hair die, two adorable rhinestone bow charms, and some candy! 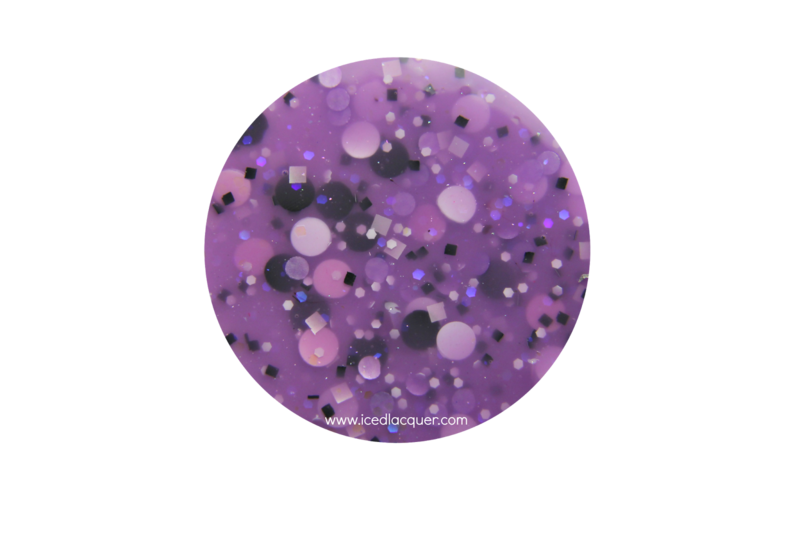 "Whack With Poo Brain" - This squishy lavender jelly base is filled with oodles of black and white matte glitter in hexes, squares, and large dots, satin lilac dots, and accented with blue/purple iridescent hexes. Out in the sunlight the iridescent hexes totally come alive and give fantastic flashes of blue, which almost makes the polish glow! Yeah, my camera kind of freaked out at this one in the sun! 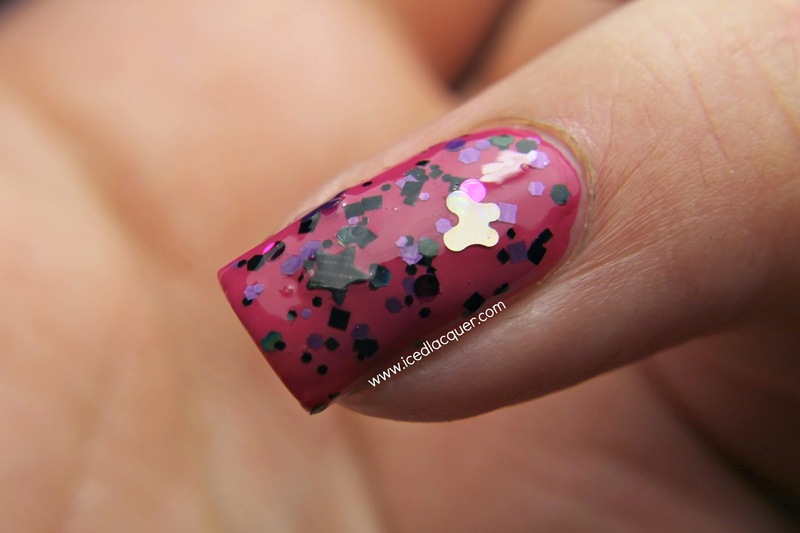 I love the monochromatic glitter mixed with the purple base! It's squishy and the base gives so much depth to the layered glitters! I used three coats plus top coat for these photos. 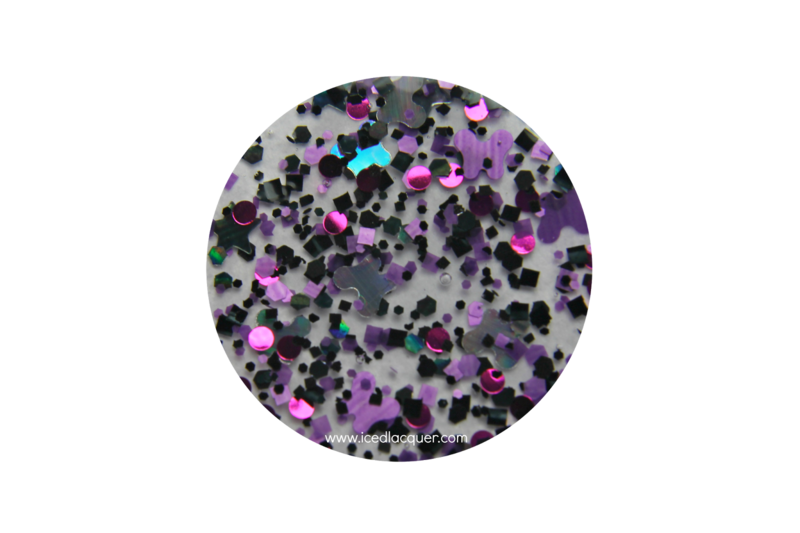 "Chronic Badass" - This clear based glitter topper is totally loaded with black hexes and squares, lavender hexes and squares, magenta dots, black holographic stars, and lastly silver holographic and satin lavender butterflies! Yes, butterflies!!! I chose to layer this on top of KBShimmer "Life Rose On" because honestly who doesn't love pink and purple together? I'm certain this would equally as fabulous on top of other shades, especially white or even a bright blue! Have I made it clear that I love the butterfly glitters in this? Because I do! This is my first polish with them and they're so adorable! I was happy to see that they didn't stick up on the nail or catch on things. I'm showing one simple coat on top with clear coat. So what do you think? These two polishes are both super unique and interesting on their own, but they still manage to play off each other and work wonderfully as a duo! The entire box sells for $20 dollars and can be purchased either through Digital Nails or ellagee. Make sure you go show both of these polish makers lots of love and support by liking them on Facebook (Digital Nails Facebook and ellagee Facebook)!